Fuentes Berry Farms is a Reiter Berry affiliate based in Salinas that has been certified organic through California Certified Organic Farmers (CCOF) since 2004. Roy Fuentes is a second-generation berry farmer and started farming while he was in high school in the 1970s working for his dad weeding, planting and harvesting. Roy’s agricultural heritage traces back to his grandfather who came to the Central Coast to work in the fields under the Bracero Program. Fuentes Berry Farms leases 135 acres and specializes in strawberries and raspberries. On the east side of Salinas the soil is formed from decomposed granite and the texture is very sandy. The soil is prone to erosion, surface runoff and sedimentation. A lack of certified organic farmland has been a barrier for Roy and to expand his operation he had to settle for 55 nonorganic acres and undergo the transition to organic. Renting acreage has been costing Roy fifty percent of his income. Fuentes Berry Farms has also been affected by farm labor shortages at harvest time. 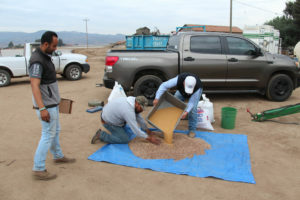 Moving the operation to Salinas and understanding the soil has been a learning process. Fuentes Berry Farms has been working to improve their soil and water management practices and one of Roy’s techniques has been seeding the furrows with mustard before and after planting the strawberries. Mustard offers the perfect crop rotation for safeguarding the soil and protecting it from water runoff by slowing down the flow of water. At the end of January the mustard gets cutback and crop residues work to suppress weeds and soilborne pathogens; when the rain comes the mustard gets incorporated back into the soil. As the mustard decomposes water percolates down into the soil into the aquifer. Merced rye and broccoli are additional crop rotations that act as a fungicide. Planting flowers at the end of each block and around the block defends against strawberry diseases and attracts both pollinators and predatory insects. The CropManage application developed by Michael Cahn at UC Cooperative Extension has given Roy a tool for organizing his data from recording soil moisture readings in the field and incorporating factors such as real-time temperature and evapotranspiration data to coordinate irrigation timing. The online app is also used for monitoring and evaluating nutrient applications at Fuentes Berry Farms. It is important to consider the soil needs of a particular crop and Fuentes Berry Farms has added a nutritional base with bed preparation. They are getting better with water efficiency through pulse irrigation so that water is only applied to the plant’s root system. Concentrating irrigation and fertilization 12 – 18’’ deep and initiating more frequent pulse irrigation allows more moisture to stay in the row. Irrigation is scheduled for forty-five minutes at a time three times per week. In 2010 Fuentes Berry Farms partnered with the USDA Natural Resources Conservation Service (NRCS) to install a 40’ x 60’ sediment basin and soil from the basin is transported with a backhoe to replenish the fields. To further support the diversion of water NRCS also assisted with seeding grasses along roadways and provided plastic for the ditches. To defray the cost of leasing his land Roy was commissioned by Monsanto to grow untreated beans for seed and this cut his rent expenses in half. Roy has been able to retain a year-round workforce by diversifying his operation so workers stay busy with farm tasks such as pruning raspberries, maintaining the mustard, weeding etc. and each year his crew knows the operation more thoroughly. In the beginning Fuentes Berry Farms had irrometers to gauge irrigation decisions. They were placed down the row, one at 6’’ and one at 12’’. The reading was created from pressure and the gauge would climb if the soil was too dry. At the time Roy was using this number system and advice from peers to work within the target range of 0-2 and between 8-10 was too dry. Roy has placed flow meters in the well and when the pump is turned on he has spent time documenting where the water would be applied. 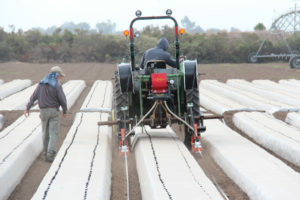 Roy landplanes his beds to level the soil and row arrangement has been designed to minimize soil loss. Cover crops retain moisture in the soil; now rainwater stays in the field and any excess water is clear and free of silt. Fuentes Berry Farms started planting mustard in 2011 on half an acre and then moved to four acres in 2012. In 2013 Fuentes Berry Farms experimented with mustard on another four acres. 2014 was a difficult year for finding available mustard seed and in 2015 the project expanded to forty acres. Currently nutrients are applied on a daily basis because the plants are fruiting now and Roy is focusing his nutrient management plan on phosphorus and calcium with very little nitrogen. Soil samples and foliar tests determine the plant nutrient exchange and often Roy will find the need to supplement boron and zinc. Today both irrigation and fertilization are automated through the drip system. Crop rotation has made a big difference and has reduced nutrient inputs and water use. All farm water usage gets reported to the county and through these water saving practices Roy was able to achieve a water savings of .25 acre-feet / acre without jeopardizing his crop. Seek out farm advisors and take advantage of USDA, NRCS, and UC Cooperative Extension. 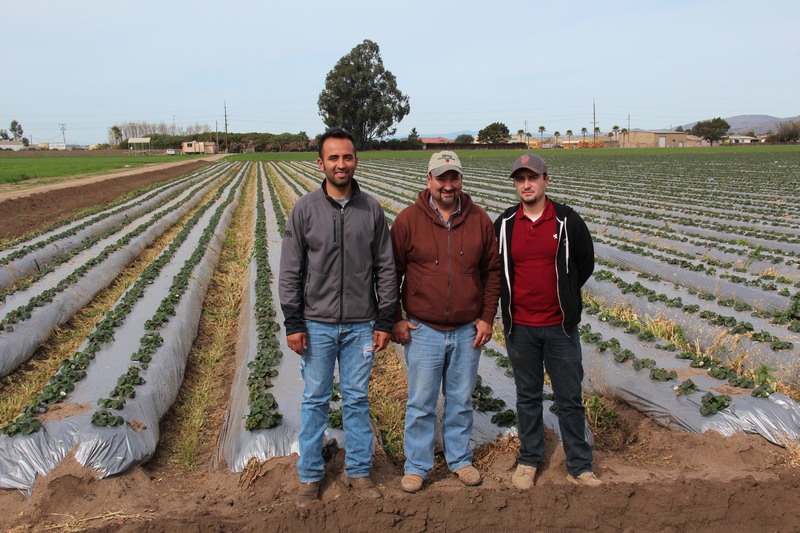 LG Organics is a new berry growing endeavor on the horizon started last year by Roy Fuentes, his wife Lupe, his daughter Isle and his son Cesar. Roy’s dream is to apply the experience he has gained in managing the soil organically to develop a successful third-generation organic berry operation with his son and daughter. Each year there is something to change for the following year and we aspire to continue to farm organic in the future without destroying the fertility of the soil.